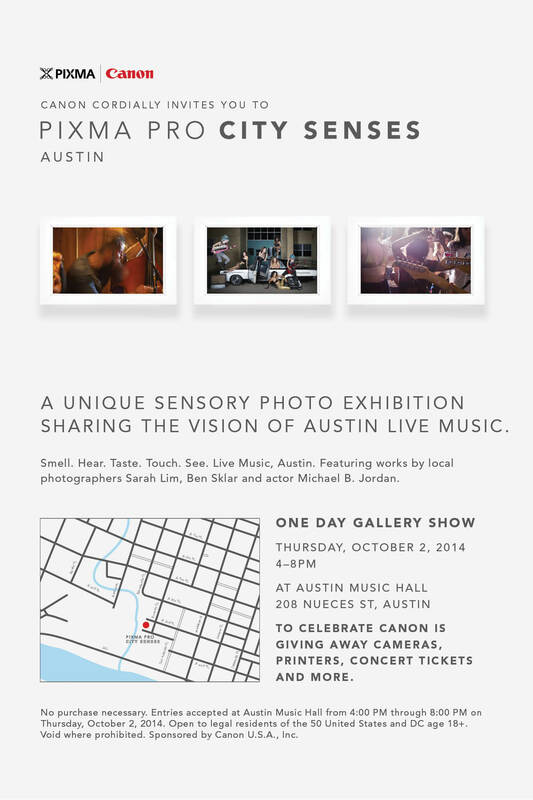 Canon recently approached Austin-based photographers Sarah Lim and Ben Sklar to capture images based on sensory triggers, that are inspired by the live music of Austin and hometown pride. As part of a three-city series for Canon’s PIXMA PRO campaign, guests who walk through the exhibits at this will interactively experience a taste, sight, sound or smell trigger, before the image associated with that sense is revealed. At the heart of the campaign, Canon’s PIXMA PRO Senses is all about bringing the photographers’ moment in a time to life and transporting individuals back to that experience, giving gallery guests the visual sensation exactly as it happened, through the power of print. “The PIXMA PRO City Senses gallery series was created to highlight how very powerful a printed image can be—how it can evoke emotions and enable the sharing of meaningful experiences,”said Canon U.S.A. president Yuichi Ishizuka in a statement. There will be a demo station on site, where guests can interact with the Canon PIXMA PRO printers. Canon will also be giving away cameras, printers, concert tickets and more.